Journal of Pharmacognosy and Phytochemistry is an official publication of the Society of Pharmacognosy and Phytochemistry (Registration no. S/2042/SDM/NW/2014). One can visit the society website through this url: www.phytochemistrysociety.com. It is an international peer-reviewed journal published bimonthly. The prime focus of the journal is to publish articles related to the current trends of research in Pharmacognosy and Phytochemistry. This journal provides a platform with the aim of motivating students and personnel in Pharmacognosy and Phytochemistry research. 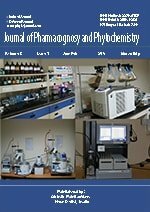 The Journal of Pharmacognosy and Phytochemistry is a member of the International Committee of Medical Journal Editors (ICMJE) and follows its recommendations. Abstracting and Indexing information: The journal is indexed with Index Copernicus, Ulrich's International Periodical Directory, Google Scholar, Indian Science, PubsHub, University of the Saarland, Saarbrücken (Germany), Libraries Directory ... Learn More. The journal considers review and research articles which include: Pharmacognosy, Phytochemistry, Ayurveda, Phytochemical, Natural Chemistry, Agricultural Science, Biotechnology, Biochemistry, Unani Medicine and Siddha Medicine. The purpose of the journal is to publish original research work that contributes significantly to furthering scientific knowledge in the field of pharmaceutical sciences. Your views and comments will be highly acclaimed. Author can send their articles to info@phytojournal.com. Online submission of the manuscript is strongly recommended.